Safe and friendly daycare that fits your schedule! 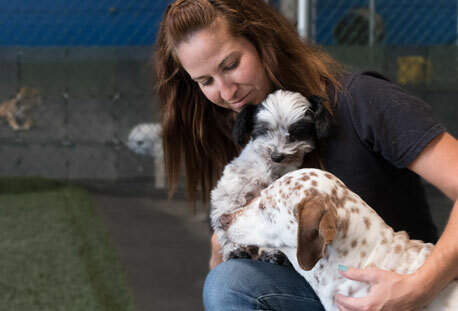 Whether you’re out all day at work or you simply want your dog to receive the socialization and exercise he needs, Dog Daycare is a great choice for pet parents in the Long Beach, CA area. Dogs would rather spend the day playing with their canine friends or caring humans than be home alone. It’s helpful to think of day care for dogs the same way we think of day care for human kids! It provides your canine friend with a safe, fun, and mentally stimulating place to spend the day. While some dogs are content to snooze on the couch while you’re away from home, others need a little extra TLC, and that’s where we step in! We also offer a variety of extra amenities for a hotel quality stay. Visit us and see why Dog Daycare at Joyful Paws Hotel is the right choice for your canine friend! Reservation required. Discount subject to availability and cannot be combined with any other offers. Day Care discount applies to first time day care customers only. There are many benefits to entrusting your dog to a well-run dog day care facility and even more reasons to choose Joyful Paws! First, dogs are social creatures and thrive on both human and canine interaction. Even a dog that’s used to hanging out at home while you’re at work will love the stimulation that comes from interacting with canine or human friends. This exposure can help build a dog’s confidence. Dog day care also provides dogs with a ton of exercise and a great outlet for all his pent-up energy. It’s unlikely that a dog that spends his days at home alone is doing laps around the living room. More likely, he’s looking for the next place to nap. When you arrive home, he’ll want to play. But how many of us spend our first few hours at home after a long day playing with and exercising our dogs? 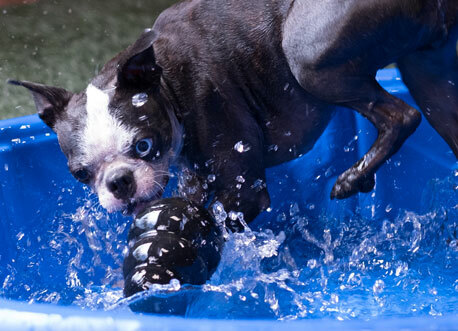 At Joyful Paws in Long Beach, your dog will get all the exercise he needs. While walks are important, they don’t provide the same romping, physical stimulation that free playing does. When your dog spends his day with his doggy friends, running around and playing provides a fantastic outlet for excess energy. A tired dog is a happy dog! There’s also housetraining. A dog that spends his days at doggy day care will never have to worry about when the next potty break is. You won’t have to worry about rushing home from work because the pup needs to go for a walk! All dogs at Joyful Paws have plenty of opportunities to relieve themselves—no more holding it until their owner gets home! This is especially helpful for very young and older dogs that might otherwise have a hard time waiting all day to take care of business. All this socialization and exercise can also reduce behavioral problems at home. Dogs, just like people, may feel lonely if they are home alone all day which can lead to a variety of undesirable behaviors, like excessive barking, howling, and whining. Dogs that are cooped can also become bored. 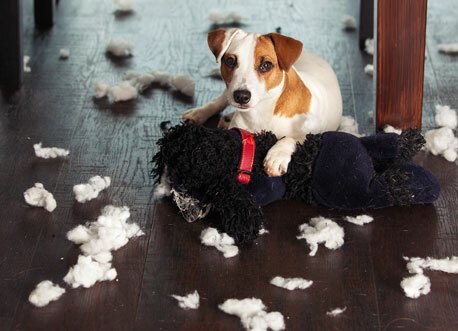 Boredom can cause a dog to become destructive. Dogs at a quality dog day care have plenty of physical and mental stimulation. Quality stimulation at Joyful Paws can curb destructive tendencies, and with all of those other dogs to play with, your dog won’t be bored or lonely! All dogs that come to Joyful Paws are carefully screened to ensure they’ll get along with the other dogs and enjoy their stay with us. Since proof of immunization and spay or neuter is required, you can rest assured knowing that your dog is safe with his or her canine companions. With all of these worries out of the way, your dog will experience hours and hours of safe socialization and playtime so you can enjoy your day! Our staff is trained to monitor dogs as they play. We also match (small dogs only socialize with fellow small dogs, etc.). The staff at Joyful Paws is trained to formulate the best playgroups and help the dogs better understand canine body language. Energetic or young dogs are matched together so they can tire one another out. 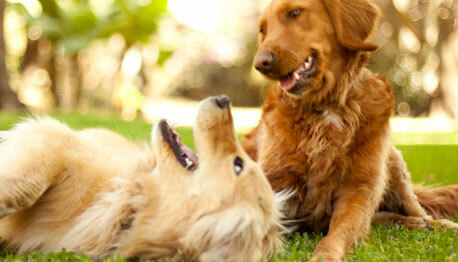 Calmer dogs can interact with their same energy level friends. Puppies also enjoy our staff’s expertise, as a little human intervention can help them learn how to navigate the canine world. Thanks to our open play dog day care environment, any dog that gets tuckered out is free to rest in the shade and rejoin the group as he pleases. And there’s plenty of fresh water available at all times. When dogs socialize, play, and exercise in a safe and secure environment, the benefits are too many to count. However, it’s important that our guests are well suited to a day care setting. That’s where our evaluation comes in. We help determine if a dog will be a good fit for day care. Shy or nervous dogs may feel overstimulated with group play. Aggressive dogs are also not well suited to the doggy day care environment. 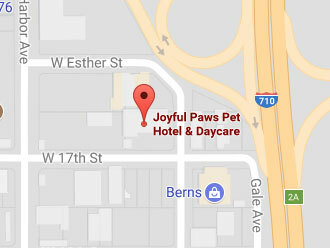 For obvious reasons, dogs that are not spayed or neutered aren’t good candidates for doggy day care and may not join in on the fun at Joyful Paws. Fun, Safe Day Care as Low as $25.95 a Day!